It's Oral Cancer Awareness Month, and there's no better time to improve your awareness of the serious nature of oral cancer and how you can prevent it. However, sometimes even the most diligent efforts at prevention fail, and oral cancer develops anyway. Due to the nature of the disease, it is much more treatable in the early stages, and that's why it is important to understand the early warning signs. You may experience a persistent sore throat, or a feeling of pain in your ear, similar to what you might feel with an ear infection. You may also experience pain in your jaw, tongue, neck, or face. Pain can be a symptom of many things, so it can be hard to tell when it’s a warning sign for oral cancer and when it’s something more benign. But any sort of pain that can’t be explained or that persists for an unreasonable amount of time – for example, a sore throat that is not accompanied by any cold symptoms and that doesn’t go away on its own in a week – should be checked out. Mouth sores can be a red flag for oral cancer. They should be examined by your dentist. Another early warning sign of oral cancer is sores or patches in the mouth. You may develop sores on your lips, gums, or other areas inside the mouth. These sores may or may not be painful. Sores caused by oral cancer may bleed or be very slow to heal. You may also notice red, white, or speckled patches in your mouth that have a velvety texture. In some cases, you may develop sores on your face or your neck as well. 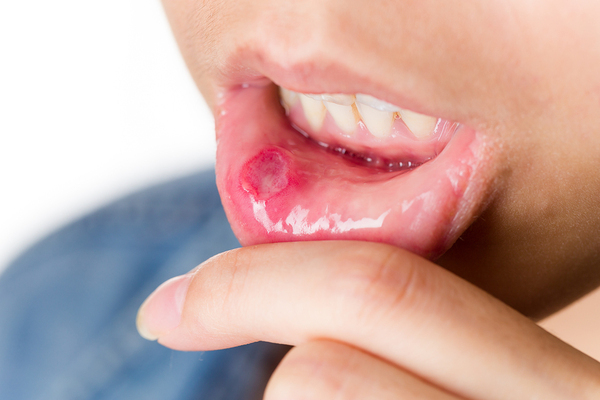 If you have sores that don’t heal within about two weeks, if you experience unexplained bleeding in your mouth, or if you notice anything else unusual about your mouth sores, it’s important to make an appointment right away to have them checked out. Some patients may notice that they have difficulty chewing and swallowing in the early stages of oral cancer. This can make maintaining your ordinary diet difficult. You may feel the sensation of something being caught in the back of your throat, preventing you from swallowing normally. This can also cause problems with speaking. If you wear dentures, you may notice that they no longer fit properly. They may move around in your mouth when they previously fit snugly, or they may not connect properly when you bite down. This can also make eating difficult. Difficulty eating can lead to weight loss. If you aren’t having difficulty eating or if your weight loss is out of proportion with what you have been eating, you should pay attention to that too – dramatic weight loss is another sign of oral cancer. It’s better to be safe than sorry. If you have symptoms that could signify oral cancer, it’s better to have them checked out early on than to wait and see if they get worse. Don’t hesitate to make an appointment to have strange symptoms checked out. To make an appointment for a dental check-up, click below to request a time that works best for your schedule.